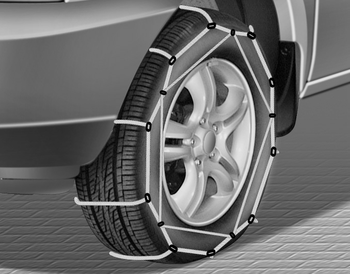 Since the sidewalls of radial tires are thinner, they can be damaged by mounting some types of snow chains on them. Therefore, the use of snow tires is recommended instead of snow chains. Do not mount tire chains on vehicles equipped with aluminum wheels; snow chains may cause damage to the wheels. If snow chains must be used, use wiretype chains with a thickness of less than 15 mm (0.59 in). Damage to your vehicle caused by improper snow chain use is not covered by your vehicle manufacturers warranty. Install tire chains only on the front tires. Make sure the snow chains are the correct size and type for your tires. Incorrect snow chains can cause damage to the vehicle body and suspension and may not be covered by your vehicle manufacturer warranty. Also, the snow chain connecting hooks may be damaged from contacting vehicle components causing the snow chains to come loose from the tire. Make sure the snow chains are SAE class “S” certified. Always check chain installation for proper mounting after driving approximately 0.5 to 1 km (0.3 to 0.6 miles) to ensure safe mounting. Retighten or remount the chains if they are loose. If your vehicle has 225/45R17 or 225/40ZR18 size tires do not use tire chain; they can damage your vehicle (wheel, suspension and body). The use of chains may adversely affect vehicle handling. Do not exceed 30 km/h (20 mph) or the chain manufacturer’s recommended speed limit, whichever is lower. Drive carefully and avoid bumps, holes, sharp turns, and other road hazards, which may cause the vehicle to bounce. Avoid sharp turns or lockedwheel braking. Chains that are the wrong size or improperly installed can damage your vehicle's brake lines, suspension, body and wheels. Stop driving and retighten the chains any time you hear them hitting the vehicle.